266 p., 10 ill., 14,7 x 20,8 cm. With contributions by Angelika Ebrecht-Laermann, Friedrich-Wilhelm Eickhoff, Gerhard Fichtner, Uta Gerhardt, Roger E. Money-Kyrle, Knut Müller, Daniel Pick and Richard Sterba. 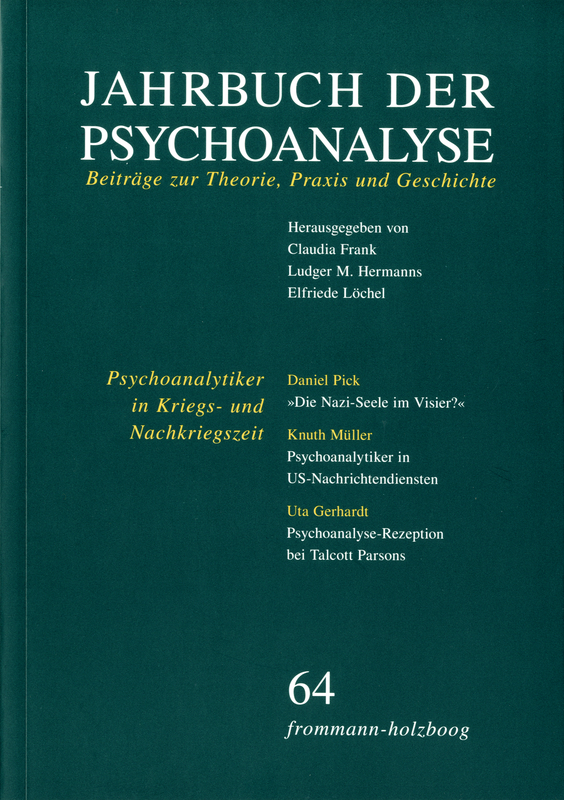 This paper discusses how psychoanalytic ideas were brought to bear in the Allied struggle against Third Reich and explores some of the claims that were made about this endeavour. It shows how a variety of studies of Fascist psychopathology centred on the concept of superego, were mobilized in military intelligence, post-war planning and policy recommendations for ›denazification‹. Freud’s ideas were sometimes championed by particular army doctors and government planners; at other times they were combined with, or displaced by, competing, psychiatric and psychological forms of treatment and diverse studies of the Fascist ›personality‹. This is illustrated through a discussion of the treatment and interpretation of the deputy leader of the Nazi-Party, Rudolf Hess, after his arrival in Britain in 1941. Since 1940, representatives of the psychoanalytic community started to collaborate with various branches of the US -intelligence community (CO I, OSS , OWI, CIA, FBI, Army, Navy, Air Force etc.). While early activities focussed mainly on the analysis of enemy propaganda (e.g. home front radio broadcasts, the analysis of enemy national character, or psychobiographical studies on Adolf Hitler), a broad array of tasks was eventually implemented and included such projects like the assessment of aspiring intelligence agents or the research and operational use of chemical warfare and so-called »truth drugs« to optimize intelligence interrogation techniques. The latter became a central point of reference during the Cold War years even for psychoanalytically trained scientists. This paper attempts to outline this collaboration, focussing primarily on the years 1940 – 1953. It aims to introduce a broader project that will deal with this rather astounding liaison in far more detail. The following is not intended to answer or to give a detailed analysis why such collaboration came about. Its only aim is to point out that such collaboration had indeed existed on a broader scale than previously acknowledged by the psychoanalytic community. Talcott Parsons, the most outstanding American sociologist of the twentieth century, adopted – mainly Freudian – psychoanalysis in sociological theory in three different contexts of his oeuvre in his »middle phase« (middle 1940s to late 1950s). For one, Parsons made psychotherapy a model for the democratization (rehabilitation, re-education) of Germany (and Japan) after the Second World War. Second, Parsons in The Social System adopted Freud’s notion of the tripartite structure of the psychic apparatus, explaining identification as well as internalization (on the background of institutionalization) and identity, as links between the social system and the personality system. He also highlighted the denial of reciprocity of the analyst who resists counter-transference, as central feature and model for change not only in psychotherapy, but democratic society as such. Third, Parsons found Freud’s theory of psychosexual development a convincing conceptual model to understand socialization of the child, as process of gradual adoption / accomplishment of competence as responsible citizen over five stages of interactive exchanges. Between the child / adolescent and the family, eventually the wider society, interactive processes of learning introduce future members of society into normal social life without the use of force or punishment. Starting from Kleist’s Essay »Über das Marionettentheater« (1810) the article interprets Rilke’s essay »Puppen. Die Wachspuppen der Lotte Pritzel« (1914) and confronts it with the puppets of the artist. The essay argues that for both authors the motif of the disabled puppet expresses anxieties about the failure of separation from the mother’s body. According to the view of the author this is a sudden failure, which is indicated in feelings of horror. Thus, the motif of the disabled puppet embodies the fright that arises, when psychotic anxieties, desymbolization and a lethal breakdown of relations are bodily experienced by the child. Kleist’s essay centers on the failure of the moment of the child’s separation from the mother’s body, a moment in which the child’s body is capable of holding itself. By contrast, Rilke centers in his fantasies about the puppets of Lotte Pritzel on the problem that children experience their bodies as dead when they kill puppets as representatives of outer objects and disemboweling instead of enlivening them projectively.